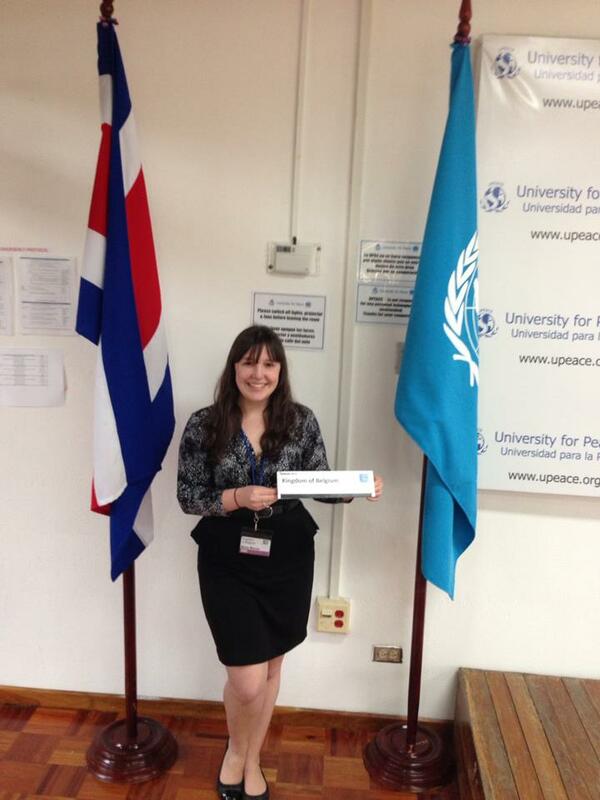 Elena Marmo ’15, Pace University New York City Model United Nations head delegate at the 2013 UN University for Peace Model UN conference in Costa Rica. As both a head delegate for our Model United Nations team and a participant in Model UN, I am faced with an interesting dynamic in the committee room. The recent 2013 UN University for Peace Model UN conference in Costa Rica was the first time as a head delegate that I was in committee with other delegates from Pace University. As Model UN is both a learning experience and a simulation, I had a difficult time separating my excitement for the success of the delegates and my country’s position. Whenever the other Pace students would make a great speech or work the crowd during an unmoderated caucus, I was filled with joy that they have learned so much from our Model UN course at Pace. I felt that as a head delegate all of our lectures, lessons, and simulations really worked. However, I had to keep this excitement to myself because I wasn’t just an observer. I was representing a nation that did not necessarily care about the success of Switzerland, Uganda, and Amnesty International. I found the balance between being a mentor and a peer to be rather difficult and I struggled to view my teammates the way I viewed everyone else at the conference. Being so invested in their success, I did not want to put them on the spot or call them out. I realized, though, that for the simulation to be truly representative of the UN, I needed to represent my nation fully, because being a head delegate requires a balance between leading and participating. This entry was posted in Student Delegate Blogs and tagged Costa Rica, Elena Marmo, head delegate, Human Rights Council, Model UN, Model United Nations, MUN, Pace University, UN, United Nations, University for Peace. Bookmark the permalink.